MiniComfort is a patented splint that you can suggest to your patients who are looking for ways to stop clenching even in the day. This appliance is so comfortable that it will not even affect speech. It also acts as a biofeedback device that can help avoid tooth wear as it addresses bruxism and clenching. The standard design which is MiniComfort 4.0 is a light, thin, and very comfortable appliance that efficiently trains the wearer to keep his or her teeth apart. When their maxillary canines contact the two elements, they train themselves to automatically relax and open repeatedly, and soon, the habit of clenching or bruxing itself is deprogrammed. Our newer product, on the other hand, which is the MiniComfort 6.0, patients who brux when they are sleeping at night can enjoy extra protection with its heavier-duty material. Both models are very comfortable to wear and have minimal effect on speech. No Adjustments – It seats in less than a minute, allowing for time for a detailed benefit discussion with your patient. It means no time wasted on grinding on acrylic. It increases profitability! Improved Compliance and Performance – It’s super comfortable, fully functional, and very stable Hassle-Free Re-Order – With the Digital record for future MCs available, patients can easily order, stop in, pick their new MiniComforts up, seat, pay, and go. If necessary, we request that you send U/L master casts and bites. To achieve great retention, MiniComfort makes use of tissue coverage to create a Hydroseal. When you are capturing the lower, please include the entire depth of the labial and lingual vestibules that are between 35 and 45. 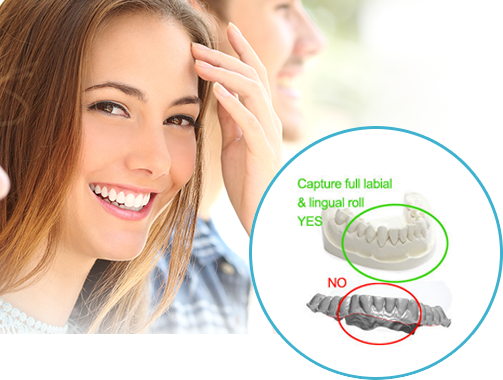 For the digital impressions, do scan 2mm beyond the tissue height of the contour in the lingual and labial vestibules. You can use a patient acceptance tool like the patented puzzle picture which can show patients the bruxism exists. It is a very simple yet convincing technique that can persuade your patients how there really is a damaging event happening. If they do not take preventative measures as soon as possible, damages in the coming years can be irreversible. For chairside technique, you can talk with your patient about tooth wear and how long it takes to get enamel worn. You can ask the patient to hold a mirror at about 30-40 degree angle but still facing forward. Ask the patient to move his or her jaw into a lateral position that feels natural and comfortable and look closely in the mirror. Often, patients place their teeth right in the position of the wear. Point out the wear to the patient and ask if he or she chews over there. Of course, the answer would be no. The wear comes from habitual and nocturnal bruxism. Take a close-up photo with your phone and share it with the patient to ponder about. The secret to that maximum comfort delivered by MiniComfort lies in the strategic placement of two discluding elements which are rigid therapeutic bands that measure about 4-6 mm. These are positioned right behind the canines making sure that the teeth are separated. These elements deprogram bruxism by minimizing bite force, thus preventing the patient from completely occluding, and helping maintain a comfortable position. Because of this deprogramming design, this wonderful appliance helps lessen clenching. It is almost undetectable even when worn during the day. And similar to other partial coverage appliance, your patient should be reminded to wear the appliance only for a few hours in a day, at their discretion of course, and depending on how stable their dentition is. With MiniComfort, your dental practice is afforded a self-seating appliance, giving you more time for patient education. Instead of spending time adjusting hard occlusal guards, you can use that time to discuss the benefits of MiniComforts. Since there are just two therapeutic bands as points of occlusal contact, there’s no need for any adjustments. Once seated, a hydroseal is formed over the dentition and mucosa, allowing for extreme comfort and good retention. Your staff can easily manage the seating appointment. MiniComfort also provides two other unique advantages – Instant Wear guarantee and Digital Record for hassle-free re-order. Because of the appliance’s nature, it is designed to be periodically replaced. That’s why we offer a second complimentary appliance for instant wear guarantee. Because each case is digitally archived, it is easy and simple to re-order as there is no need for another impression to be taken, as long as the patient’s dentition did not change. Close to 100% of the participants in the study conducted continued to wear MiniComfort because of how convenient and comfortable it is to use. Get in touch with Dental Laboratory Associates to find out how you can provide your patients with MiniComfort and save their teeth from clenching and bruxing. Of course, if you or your patient is not thrilled with the appliance, you can try a conventional appliance that is also available.